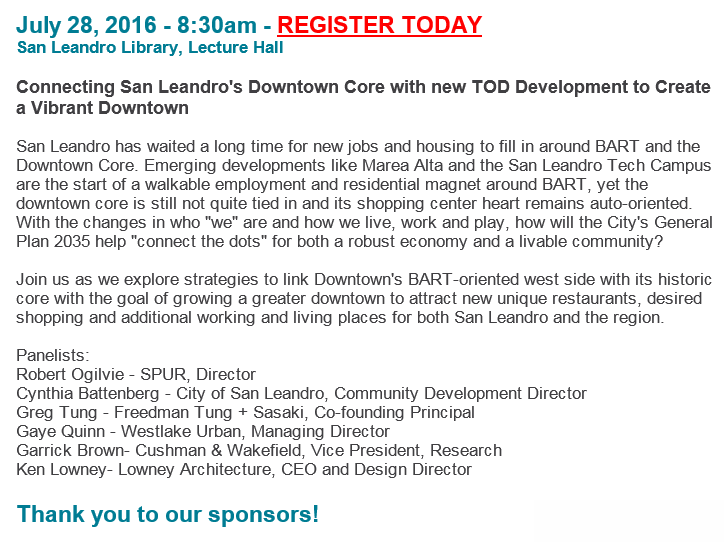 San Leandro by Design is back! The San Leandro Chamber of Commerce is kicking off a 3-part series beginning this Thursday, June 28th at the Main Library to celebrate, explore and engage in the transformation that is taking place in the City’s Downtown. The Downtown Transit Oriented Development strategic plan adopted by the City in 2007 has successfully attracted new housing and office development; the Downtown core is experiencing a surge of new restaurants; a variety of new art installations are engaging San Leandrans and our visitors in new and positive ways. What are the strategies this City can employ to effectively connect the Downtown core with these new developments? What will it take to accelerate the City’s efforts to create a walk-able and connected Downtown? Robert Ogilvie, the Director of SPUR Oakland, will help to lead this conversation, along with Cynthia Battenberg, San Leandro Community Development Director; Gregory Tung, Freedman Tung + Sasaki; Gaye Quinn, Westlake Urban Managing Director; Garrick Brown, Cushman & Wakefield, VP Research; and Ken Lowney, CEO Lowney Architecture (architect for the new mixed use development at E. 14th and Callan, former CVS site). Please join us to engage in this conversation! To register for this 1st event on July 28th, please click here or below. When I attempt to register for the event I’m informed the cost is $25 but only after I submit my personal information. Is this intended for Businesses of Residents? It would be nice to have this in the evening so that those of us who work during the day could participate. I’m very interested in hearing this conversation because so far the city has made ridiculously bad decisions – just look at the waste of a perfect opportunity with the development at Dolores & East 14th. Steps must be taken to prevent things like that from ever happening again. This is not a community based meeting . It should for one be free to the community. It is set at a time for busisness company , developers and such . 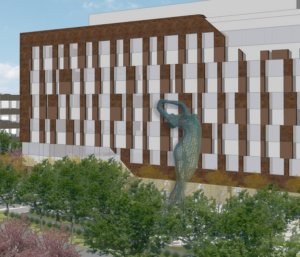 What about all this design and money and no mention of the homeless community which is growing daily, The homeless have no where to go in San Leandro for support services for what you call a growing downtown. Maybe when they start setting up tents like SF and Oakland will San Leandro think about its communities that are not able do to Mental illness and drugs, remember most people that are homeless are taking drugs to self medicate.